Could Volkswagen be on the verge of bringing the Tanoak pickup truck to production? They’ve debuted it, dropped not-so-subtle hints that they could produce it, and then, at this weekend’s Monterey Car Week festivities, they tossed us the keys to their priceless, one-of-one concept. 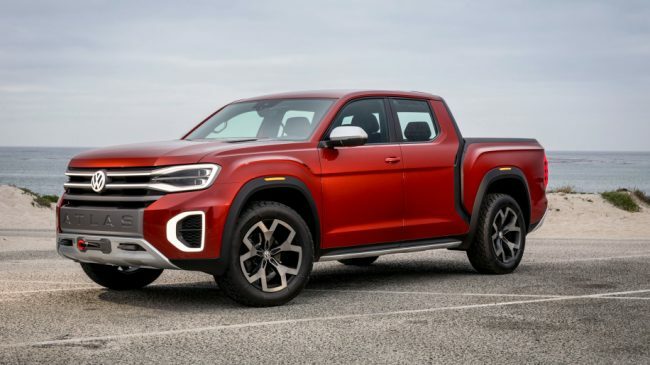 The hotly contested truck segment has been haunting Volkswagen’s dreams, so much that it has inspired the German carmaker to seriously explore the feasibility of mass producing the unibody Tanoak at their Chattanooga facility. The pickup segment is a strong one, with 2.8 million pickup trucks finding new owners in 2017 — though most of those trucks feature frame-on-body, not unibody, construction. But while the struggling-in-the-U.S. Volkswagen brand is unlikely to impact the sprawling segment, even a small slice of that pie would constitute a significant sales bump for VW. The dual-cab five-seater, with its short-bed configuration, comes in 11 inches longer than the Atlas; not surprising, since Tanoak was named after a species of tree that grows to 135 feet high. Cargo capacity is a claimed 1,000 kg (or around 2,200 pounds), and towing capacity is estimated at 7,000 pounds. Does America need another pickup truck? My time with the Tanoak concept wasn’t necessarily about answering that question, though one incident did shed some light about what could make or break the success of this theoretical truck. When pulled over for some photos, a Tacoma driver stopped and hopped out of his well-worn truck, excitedly asking questions about my borrowed steed. What was it, what was under the hood, and when is it coming? VW spokesperson Martin Hube suggests that, if given the green light, the Tanoak could be produced in as little as two years. But more crucial than the feasibility question is whether Volkswagen’s theoretical production truck will look as dazzling as the concept; the world might not need another truck, but it certainly will want one if it’s as visually striking as this tantalizingly tangible concept.